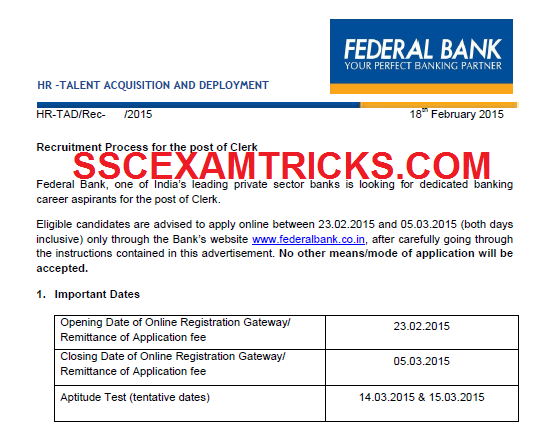 Federal Bank (FB), one of India’s leading private sector banks has released latest notification advertisement on 18th February 2015 for the posts of Clerks for Graduate candidates passed with minimum 55% marks for Science discipline and minimum 50% marks for other streams from any recognized university. The latest news is that the online application for these posts will be started on 23rd February 2015 on the official website of Federal Bank. Last date to apply online for these posts is 05th March 2015. The last date for paying application fee is also on 05th March 2015. Candidates must remind that only online mode of application will be accepted. No other means/modes of applications will be accepted. Before the registration, Candidates are requested to ensure that there is a valid email id in his/her name on any of the website like Gmail yahoo Rediffmail Hotmail etc. The final selection of the candidates will be based on Aptitude Test / Written Test, Group Discussion and Personal Interview or any other mode of selection to be decided by the Bank. The tentative dates of written examination are 14th March 2015 and 15th March 2015 at various centres i.e. Ahmedabad, Amritsar, Bangalore, Chandigarh, Chennai, Coimbatore, Ernakulam, Hubli, Indore, Jaipur, Kolkata, Kozhikode, Lucknow, Madurai, Mumbai, Nagpur, New Delhi, Pune, Surat and Thiruvananthapuram. Online Aptitude Test will be followed by a Psychometric test for a maximum duration of 30 minutes. Ahmedabad, Amritsar, Bangalore, Chandigarh, Chennai, Coimbatore, Ernakulam, Hubli, Indore, Jaipur, Kolkata, Kozhikode, Lucknow, Madurai, Mumbai, Nagpur, New Delhi, Pune, Surat and Thiruvananthapuram. Selection will be based on Aptitude Test, Group Discussion and Personal Interview or any other mode of selection to be decided by the Bank. Federal Bank Aptitude Test will be conducted on 14th & 15th March 2015 in Morning and Evening Session. The Aptitude will be conducted by Online Mode. There will be NO OMR sheet will be filled by Blue/Black ball point pen. A rough blank sheet will be issued for calculations/rough work in exam. The exam will be conducted an objective multiple choice question paper containing 150 questions of 150 marks. The time duration for the exam will be 2 hours or 120 minutes. The exam will consist of four sections contains questions of quantitative aptitude (30 questions of 30 Marks), Reasoning (35 questions of 35 Marks), General & Financial Awareness (30 questions of 30 Marks), English Language (35 questions of 35 marks. The exam will be a multiple choice question paper in which five options will be provided out of which candidates need to choose one correct answer. There will be negative marking of 1/4th marks for each wrong answer. Online Aptitude Test will be followed by a Psychometric test for a maximum duration of 30 minutes. The shortlisted candidates based on the performance in aptitude test will be called for group discussion and interview followed by document verification of the candidates.